Beautiful useful SOAP SCRAPS...a wise and thrify purchase for the Frugal Yankee in all of us! WASTE NOT...WANT NOT!! When times are tough, why waste anything? Our 2 lb. 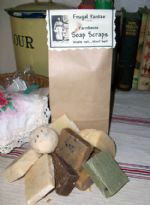 bag of soap scraps will keep you in soaps for a very long time and at a bargain price! And while beautiful handcrafted soaps are still an affordable luxury, a bargain is hard to resist! So I'm offering a bag full of great "soap scraps"....off cuts and end pieces that are too small to sell as whole bars, but too darn good to throw away. You get a minimum of 2 pounds of assorted soap scraps, an assortment to please everyone. We mix it up so you get a good variety. You'll be surprised at just how big some of these "scraps" are! This is one bargain no Frugal Yankee should pass up! Packaged in our lined kraft bag with tin ties and a great old frugal yankee on the label. Limited quantities.